Don't throw away your confidence! 35 Therefore, do not throw away your confidence, which has a great reward. 36 For you have need of endurance, so that when you have done the will of God, you may receive what was promised. 37 FOR YET IN A VERY LITTLE WHILE, HE WHO IS COMING WILL COME, AND WILL NOT DELAY. 38 BUT MY RIGHTEOUS ONE SHALL LIVE BY FAITH; AND IF HE SHRINKS BACK, MY SOUL HAS NO PLEASURE IN HIM. 39 But we are not of those who shrink back to destruction, but of those who have faith to the preserving of the soul. There is something a Christian really needs, - and that is boldness. You can get saved without having so much boldness, - those are the ones who walk trembling through the gate, but nevertheless go through it, - and so some boldness is there, because they have after all received the testimony of Jesus, - still they’re faith remind you more of a smoking wick than a fully lit candle. But they don’t really become anything for other people these ones, - that is as Christians. It’s like there is no glow! – If there is a testimony meeting, they have never anything to say, - I’m not thinking about those who really would like to say something, but lack that kind of boldness, - there is no eagerness in them to want meeting in the village, a gathering around God’s word, no need and eagerness for others to hear and get saved, - they’re just there, - no emanation of either joy or peace, but rather melancholy. Why? – Because there are no boldness! And there is no possibility that a person can get boldness himself, - it’s not like that, like now I’m pulling myself together and say to myself: “No, now I have to start being more bold” – and then I really go for it. No, there is something that gives birth to boldness, and when that is present, then boldness has to come, - that is faith! When the gospel was revealed in my heart, I got boldness to believe that I was a child of God! – Then I got boldness to believe that my case with God was good. And it is this boldness you received by believing the gospel that the apostle here asks you not to throw away; - because has the Lord received you for Jesus Christ sake, then He has received you completely, without any proviso, - He has received you on behalf of Jesus bill, and not your own, - and Jesus lack nothing, you know! You see, if you get your eyes fixed onto what I am preaching for you now, - your eyes moved away from yourself and onto Him, then there is probably one thing that you notice; - the boldness increases! I can count on Him, you see! I remember the wrong understanding I had about this thing called boldness, when I was a new Christian; - I heard many witness about boldness having a big reward, like boldness to testify, confessing the name of Jesus out in the open etc., - and I wasn’t always bold like that, so I felt judged, in this context, with an afflicted conscious, - and I could not count on any reward! Until I saw what it was really about; - the apostle writes in the same chapter in the letter to the Hebrews: “Therefore, brethren, since we have confidence ((boldness) for instance Norw. transl.) to enter the holy place by the blood of Jesus” (v.19). That is the boldness that has a great reward! – That you believe the testimony of Jesus Christ, God’s Son’s blood, and enter before the throne with it! – Because what is it that the Word testifies about this blood? – “the blood of Jesus His Son cleanses us from all sin.” (1 Joh.1:7), - from all sin! What is it then that will shut me out from God’s holy place? I am then without sin! – We read that this blood cleanses from all sin. So you see it is the faith that gives birth to boldness. Therefore you must hear the word of faith over and over again. Where it cannot attach at all, the human being remains in his sin and perishes, - and where it just gets attached a little, there will be birthed, as already mentioned, only a little boldness, and you become like someone who is surrounded by doubt and obsession and discouragement, and just ail yourself through life. Maybe you should ask God for forgiveness for the sin that you have had so little faith in His testimony about Jesus, His Son? He also forgives sin today! “Now where there is forgiveness of these things, there is no longer any offering for sin.” (no need for offering; Norw. transl.) (v.18). Take this little word is and let it sink so deep into your heart as possible! It is finished! – It is completed! – And there is no need for any sacrifice for sin anymore. What happens wherever we hear this message and it isn’t rejected is that faith arises, - and that is a powerful thing! – You heard what was preached in our message: “But my righteous one shall live by faith.” (v.38a). Shall live! – shall live eternally! Not the one who is righteous by his works, - because there is none, - but the one who is righteous by faith! Believe in Jesus and what He has done for me, - completely on the outside and independent of me. I believe in something that somebody else did! – And I cannot find that in my own chest, you know – no, I find that in heaven by God’s right hand, in Him, of whom it says: “When He had made” - Made! – “purification of sins, He sat down at the right hand of the Majesty on high” (Heb.1:3b). That is what gives you and me boldness to go right in there, - He, our Savior, has gone in there before us! “For we do not have a high priest who cannot sympathize with our weaknesses, but One who has been tempted in all things as we are, yet without sin.” (Heb.4:15). “Therefore, do not throw away your confidence, which has a great reward.” (v.35). – Do you understand the verse better now? – It is that kind of boldness that has a great reward. “For you have need of endurance, so that when you have done the will of God, you may receive what was promised.” (v.36). – Therefore this admonition to not throw away boldness, - because there will be a struggle to keep it, - we need patience, - because you look at yourself and everything that is wrong, - you look at the congregation, - how it sleeps inn and maybe decreases, you look at the world around you, and – yes, it will surely be a struggle to remain bold! – But God’s word to you will then be over and over again: Look at Jesus! “When you have done the will of God.” (v.36b). Listen to what the will of God is for you: “For this is the will of My Father, that everyone who beholds the Son and believes in Him will have eternal life, and I Myself will raise him up on the last day.” (John 6:40). This is the will of the Father for you, - that you shall see the Son and believe in Him, and by that have eternal life! But then it says something very serious that we should consider here at the end: “But my righteous one shall live by faith; and if he shrinks back, My soul has no pleasure in him.” (v.38). That’s a special expression: - To shrink back. To withdraw. Not the obvious attack, - as we can see now and then, - but that you withdraw yourself, - this: No thanks! – Maybe even performed with a polite and humble way, but still a no thanks! This no thanks! – This withdrawal leads to destruction, we read in the next verse. But then this positive expression from the apostle appears here, - and if we all only could have a yes and amen in our hearts to that: “But we” – we! – are you included here!? ”- are not of those who shrink back to destruction, but of those who have faith to the preserving of the soul.” (v.39). “Believe in the Lord Jesus, and you will be saved, you and your household.” (Acts 16:31). 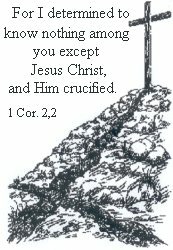 Not in any Jesus that is preached, - no, the Lord Jesus Christ, He who the Scripture testifies about, - He who made purification for our sins, by His perfect life of a deputy and by His sacrificial death on the wooden cross. Him you are allowed to have faith in! – A trustworthy statement! – As the apostle expresses in 1.Tim.1:15.